What Do Fans of Women’s Sport Want to See? Leading up to the Winter Olympics in Vancouver the US Women’s National Hockey Team has been training here in Blaine, MN and going on tour to play exhibition games to prepare. I had the opportunity to support the team and watch two games over the winter break. While at the game I saw the program (Thanks to The Good Dr.!) and immediately felt my blood pressure rising. This program, which was being sold at both the games I attended, looks nothing like the team’s online media guide. 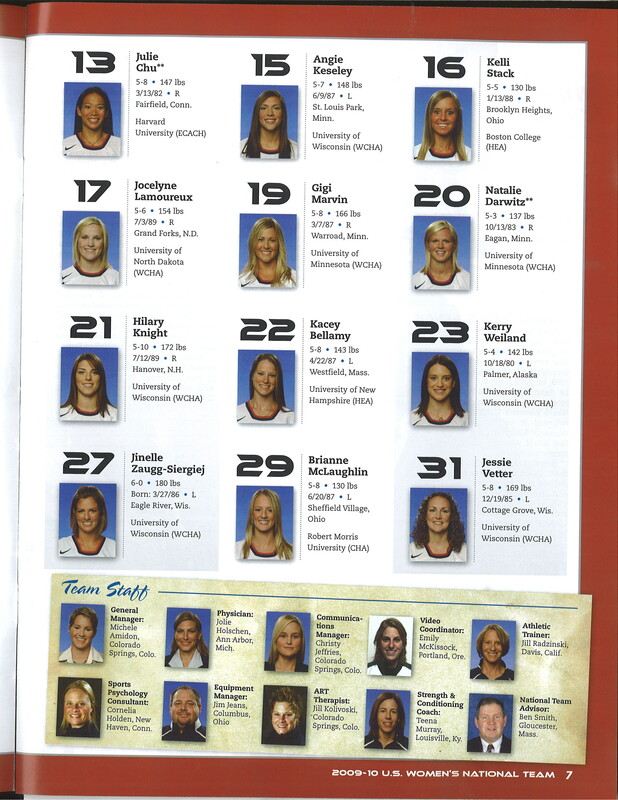 The program starts out appropriately as you can see with the Team Roster picture. As you flip through the program, you see pictures of the team in “street clothes” and get a synopsis about “The Player” and “The Person” in the “Get To Know ‘Em” centerfold section (scroll down to see pictures of program pages). Why is this problematic? For decades sport media researchers have demonstrated that female athletes (compared to their male counterparts) are much more likely to be pictured out of uniform, off the ice/court, and in poses that depict femininity and/or sexiness. Where are the pictures of the team IN THEIR UNIFORMS and IN ACTION? These women are some of the best female hockey players in the world! Marketing the athlete-person duality of female athletes has become the default strategy for a majority of sport marketers in the last five years. Where did this strategy come from? Who decided this was the status quo? Is it based on research pertaining to what is effective in marketing female athletes and women’s sport? Is this what fans of women’s sport want to see? I want to to see the evidence! Some of the evidence that I and colleagues have collected indicates that fans of women’s sports and female athletes attend because of the athleticism, not because the athletes are cute “girls next door” or look good in a sundress. So here is my question: Are the “Get To Know ‘Em” pictures, what fans want to see or have fans been sold these images so they do not know any different? My logic: If marketers continually pitch the athlete-person duality, this is what fans see and expect, and it becomes the norm, so fans think they like this approach. But what if consumers only saw images of female athletes IN ACTION, IN UNIFORM, DOING WHAT THEY DO BEST? Would that become the expected and the norm? I really want to know when and who decided that to successfully market elite female athletes that a “personal”/ human interest component has to be included. It is also not coincidental that a good portion of the “Team Tidbits” in the bottom picture below reinforce very feminine, traditional roles for women. NOTE: In the Qwest Tour program, in which these 3 images were taken from, I counted only 4 action shots in the entire 37 pages program. RELATED NOTE: Do fans really want to see pictures of tennis player Venus Williams’ flesh-colored underwear? I would argue they do not, but when the media covers and makes it “newsworthy” then fans and general sport consumers are told this is important and begin to pay attention. I am wagering that more people know about V. Williams’ underwear than how she is playing in the Australian Open. Newsflash: female tennis players have been wearing “flesh colored” underwear for years. However, when the “flesh” color matches that of an African American skin tone it becomes international news. US Women's National Hockey Team "Get to Know 'Em"
What women don’t want to see is what Venus did at the open. And what pray tell did the good doctor think of what Venus Williams wore at the Australian open? That is the person she should go after for setting women back eons with her idiot thinking of what fashion is. Makes me sad to be a woman if it weren’t for Vonn and other great atheletes like her. pov-I am well aware of why Venus was wearing that particular tennis dress design. My point to question that the color of a woman’s underwear becomes media fodder only when she is non-White? BTW The athlete-person approach is used extensively for both male and female athletes. And the reinforcing of trad roles is also the usual approach across the board. Historically, a big part of sports in school has always been about reinforcing trad roles. This is another reason why the mere fact that so many woman athletes are well embraced by the society at large is a very positive thing. This article makes a salient point. The athlete-person approach is used for men and for women, as corporate sponsorship and branding of teams and players takes hold, turning sport ever more into entertainment and not about actual play. It feels to me that instead of serving to market female athletes, these images of them off the field/track/rink/court actually undermine their power as athletes. It’s like saying, ‘They’re really not so threatening, y’all! They’re just little girls! You can still salivate over them and sexualize them – you don’t have to treat them as serious athletes!’ It would seem nice to let athletes of all genders be deemed fully rounded people, but with the ways women are overly sexualized and ‘feminized’ when portrayed out of uniform belies that attempt. And no, I don’t care about Venus’ underwear, or any of her clothing choices, actually.